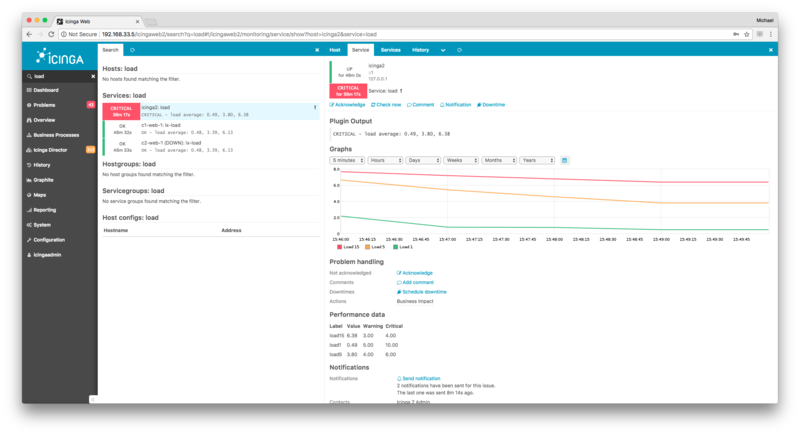 Graphite is a time-series database storing collected metrics and making them available through restful apis and web interfaces. You need to install Graphite first, then proceed with configuring it in Icinga 2. 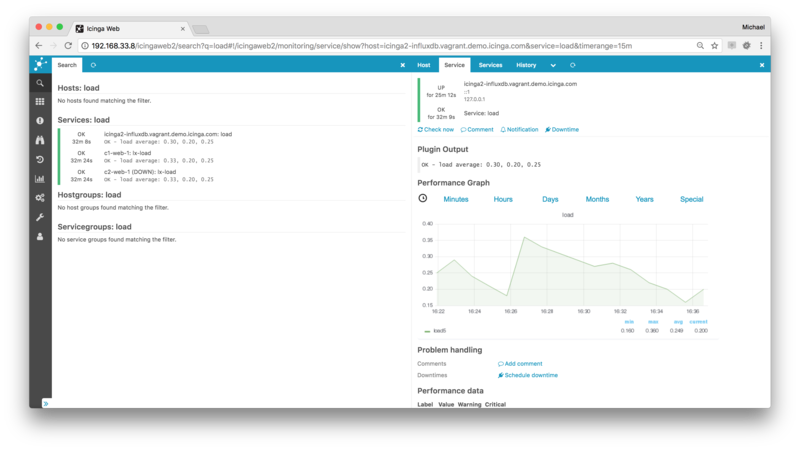 Use the GraphiteWriter feature for sending real-time metrics from Icinga 2 to Graphite. A popular alternative frontend for Graphite is for example Grafana. Integration in Icinga Web 2 is possible by installing the official graphite module. InfluxDB is a time series, metrics, and analytics database. It’s written in Go and has no external dependencies. Use the InfluxdbWriter feature for sending real-time metrics from Icinga 2 to InfluxDB. A popular frontend for InfluxDB is for example Grafana. Integration in Icinga Web 2 is possible by installing the community Grafana module. PNP is a graphing addon. PNP is an addon which adds a graphical representation of the performance data collected by the monitoring plugins. The data is stored as rrd (round robin database) files. Use your distribution’s package manager to install the pnp4nagios package. If you’re planning to use it, configure it to use the bulk mode with npcd and npcdmod in combination with Icinga 2’s PerfdataWriter. NPCD collects the performance data files which Icinga 2 generates. Set perfdata_spool_dir = /var/spool/icinga2/perfdata and restart the npcd daemon. There’s also an Icinga Web 2 module for direct PNP graph integration available at Icinga Exchange. More information on action_url as attribute and graph template names. This community module displays host objects as markers on openstreetmap in Icinga Web 2. It uses the data provided by the monitoring module and as such the DB IDO from Icinga 2. If you configure multiple hosts with the same coordinates, i.e. servers in a datacenter, a clustered view is rendered. Check the Map module docs for more details on installation, configuration and integration. 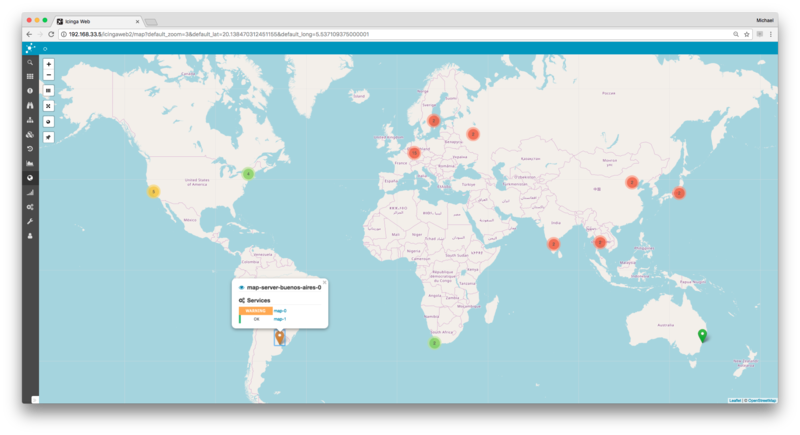 The Icinga 2 dashboard is built on top of Dashing and uses the REST API to visualize what’s going on with your monitoring. It combines several popular widgets and provides development instructions for your own implementation. 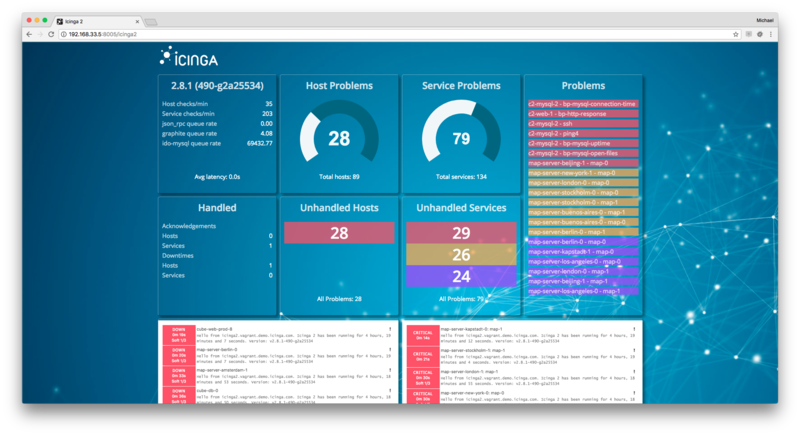 The dashboard also allows to embed the Icinga Web 2 host and service problem lists as Iframe. Create top-level views of your applications in a graphical editor. Rules express dependencies between existing hosts and services and let you alert on application level. Business processes are displayed in a tree or list overview and can be added to any dashboard. By using the DB IDO feature you can create your own network maps based on your monitoring configuration and status data using NagVis. If you are planning an integration into Icinga Web 2, look at this module. By enabling the DB IDO feature you can use the Icinga Reporting package. 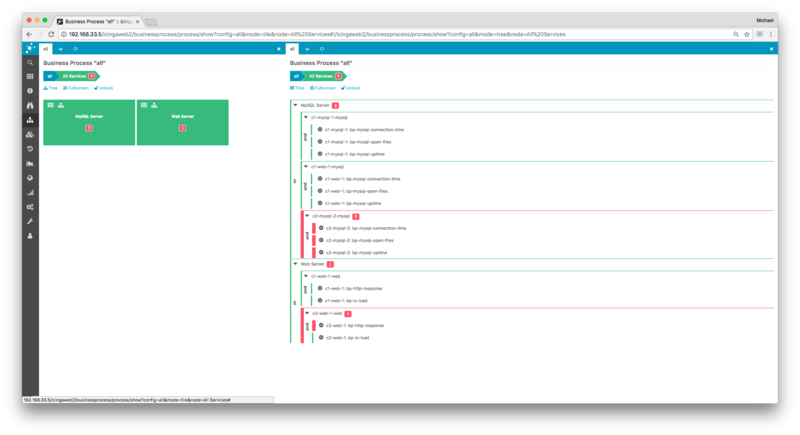 Thruk is an alternative web interface which can be used with Icinga 2 and the Livestatus feature. Using Logstash or Graylog in your infrastructure and correlate events with your monitoring is even simpler these days. Use the GelfWriter feature to write Icinga 2’s check and notification events to Graylog or Logstash. Configure the logstash nagios output to send passive traps to Icinga 2 using the external command pipe. Execute a plugin to check Graylog alert streams. More details can be found in this blog post. More information can be found on the Icinga Website. If you require your favourite configuration tool to export the Icinga 2 configuration, please get in touch with their developers. The Icinga project does not provide a configuration web interface yet. Follow the Icinga Blog for updates on this topic. If you’re looking for puppet manifests, chef cookbooks, ansible recipes, etc. – we’re happy to integrate them upstream, so please get in touch with the Icinga team. They work in a similar fashion for Icinga 2 and are used for 1.x web interfaces (Icinga Web 2 doesn’t require the action url attribute in its own module). The latter becomes difficult with agent based checks like NRPE or SSH where the first command argument acts as graph template identifier. There is the possibility to define the pnp template name as custom attribute and use that inside the formatting templates as SERVICECHECKCOMMAND for instance. In PNP, the custom template for nrpe is then defined in /etc/pnp4nagios/custom/nrpe.cfg and the additional command arg string will be seen in the xml too for other templates.